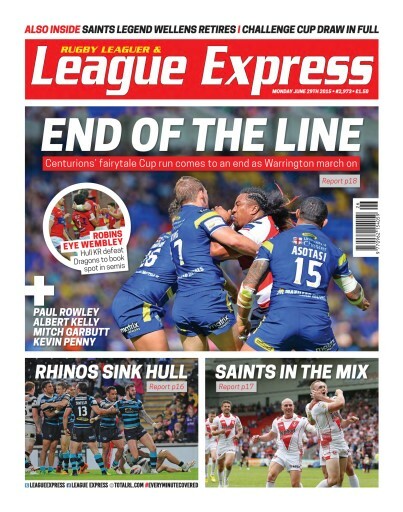 In this week's League Express we have all the excitement of the quarter-finals of the Ladbrokes Challenge Cup and the semi-final draw, with reports and photos from every quarter-final match. We also have full coverage of the Kingstone Press Championship and League One competitions, as well as full coverage of the NRL competition in Australia and New Zealand and the best coverage you will find anywhere of amateur Rugby League. We have all the news stories that tell you what is happening in the world of Rugby League, including an interview with RFlL Chairman Brian Barwick about the potential for raising Rugby League's profile offered by this autumn's Test series against New Zealand. Our editor Martyn Sadler writes a tribute to retired St Helens captain Paul Wellens, and we looks at the excitement of Saturday's Cup clash between Warrington Wolves and Leigh Centurions. 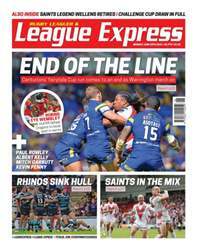 Garry Schofield, Gareth Walker, Phil Hodgson and Malcolm Andrews also give their take on the current Rugby League scene.